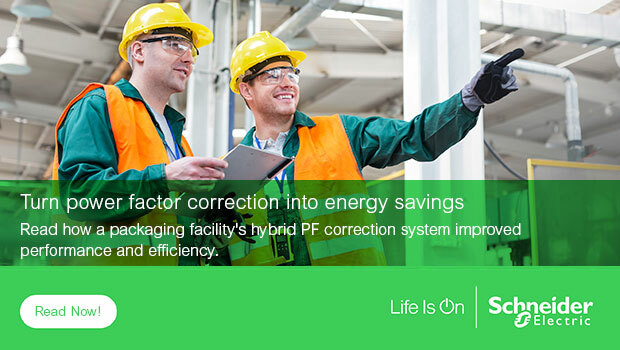 Among the more confounding issues facing industrial-plant operators is the challenge of power factor correction. Though power factor can be explained simply as the ratio of useful power to the total power drawn from the grid, it can remain a puzzle to both understand and to address. Industrial operations are especially susceptible to power factor problems because of the dynamic loads they can incorporate. Cranes, welders, saws and other such equipment can create electrical conditions requiring power factor correction to both improve overall efficiency and reduce the related penalties that can show up on monthly utility bills. The packaging production facility owned by Oji Fibre Solutions in Levin, New Zealand, was facing just such problems. The plant – owned by Tokyo-based Oji Group, a global producer of market pulp, paper and fibre-based packaging products – supplies a variety of food, beverage and industrial customers with packaging solutions. It’s a comprehensive operation that turns delivered timber into corrugated products, requiring just the kind of machinery that can create the need for power factor correction. Plant engineers knew there were two basic approaches to improve overall load profiles – capacitors and active power factor correction systems. Capacitors have long been the solution in such situations, and remain a frequent choice. More recently, however, digital correction systems have come to market that can more quickly react to dynamic and unsteady loads, like those produced by the kinds of equipment Oji Fibre operates. The downside of these devices, however, is the significant heat they can emit during operation, along with a higher first cost. Technicians from Wellington-based Gael Switchboards helped Oji’s engineers develop a hybrid solution that combines the best of both options. This design combines Schneider Electric’s AccuSine PFV+ active power factor correction units and VarPlus capacitors. Now the plant’s power factor performance rates consistently above target levels without the hazard of excess heat and at a lower cost than a system based solely on digital technology. You can read more about how our power factor correction products helped Oji Fibre Solutions improve its power system’s performance in this case study. And you can check out our full power factor correction lineup on our website.